Music and writing are often symbiotic elements of the creative process. Plenty of writers soak up background tunes for inspiration while penning their latest poem, chapter, or blog. But how many writers do you know actually take to the stage and become their own muse? Music helps enhance my creativity by thrusting me into my dream space. But sometimes just listening isn’t enough. I want to become the music; I need to live inside it. 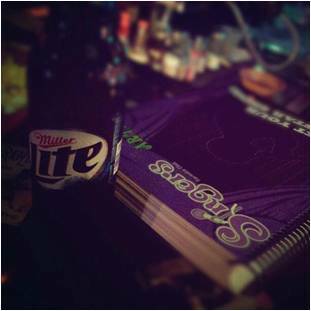 A small brick building on Milton Avenue in Syracuse, New York houses a hidden gem: Singers Karaoke Club. 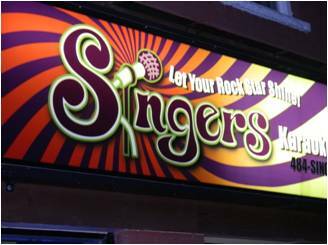 It’s a place, as its tag line reads, which encourages you to “let your rock star shine.” For the regulars who frequent Singers—many of whom are my best friends and biggest supporters—this home away from home is kind of like Cheers…with microphones. Over the years I’ve been told by countless writers and mentors that in order to create a successful story, the author must first be thoroughly acquainted with her characters. As I step onto that stage at Singers, I choose to become a certain character that I’ve created. When I clutch that microphone between my sweaty palms, I am no longer Kaitlin Keller, graduate student; I am transformed into the spirit of whichever character I wish to explore as I absorb and emit his energy. I dwell behind his eyes and immerse myself into his psyche. Okay, so I may have to use my imagination quite a bit, but in our profession that shouldn’t be a stretch. The trick is to let the music carry you into your dream space. particularly beneficial for me because my current story world is populated by musicians. But no matter who your character is—he may be a hit man who suddenly develops a conscience, or perhaps she’s a nun who becomes disillusioned with the church and contemplates leaving—putting her in an unfamiliar or uncomfortable situation (such as singing in front of a crowd) will reveal a great deal about her nature and personality that you, even as her architect, may not have known. This helps to establish layers in your characters, which in turn generates tension and conflict in your story world. And if you’re having trouble formulating your own characters, a karaoke bar is an enchanting well of unique, idiosyncratic personalities. Listening to others sing karaoke exposes me to different artists, songs, or genres of music that may potentially influence my writing. 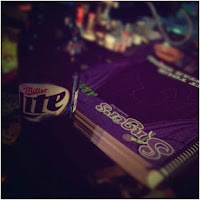 Occasionally the shy girl sitting at the end of the bar will begin belting a tune that speaks to me or my story world. 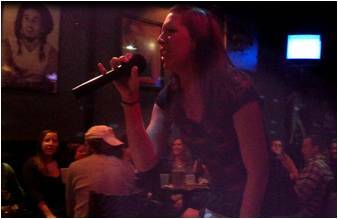 While music never fails to spark my imagination, karaoke inspires me by drawing me into my dream space. So at closing time when I go home and sit at my computer, I am prepared to write the character whose voice will not be still.